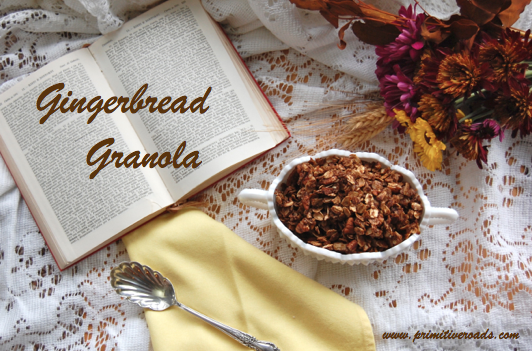 Granola gets amped up for the holidays with traditional gingerbread touches. 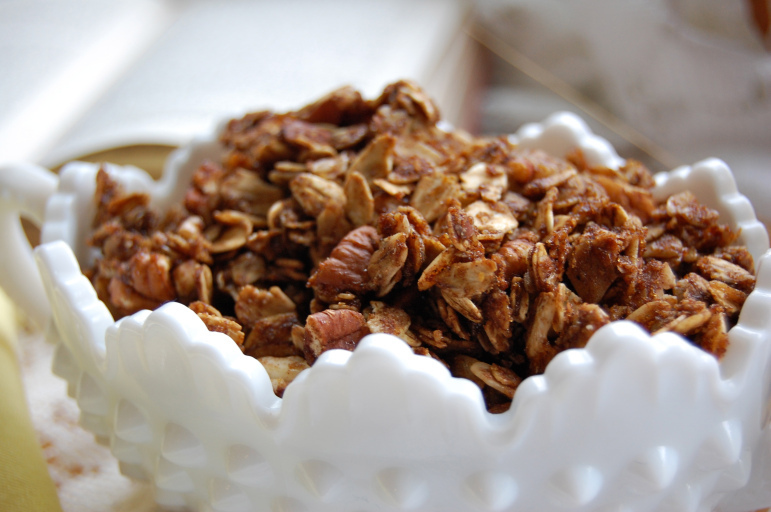 Molasses gives the oats and toasty pecans a beautiful color and rich flavor. The addicting blend of spices mirrors the taste of a warm, thick slice of gingerbread. Hunger has virtually nothing to do with my uncontrolled consumption of this granola. I can’t keep my hand out of the jar or stop myself from pouring a bowl with almond milk for an “anytime” snack. I keep imagining it on top of Pumpkin Greek Yogurt, mixed into waffle or pancake batter, or topped with a dollop of lemon curd. Adapted from a recipe by Alton Brown. 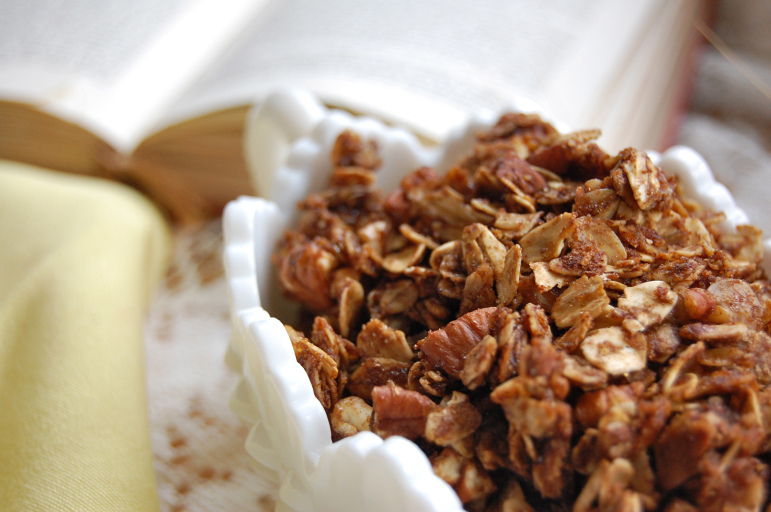 I love the dry, crispy texture of this granola and it still manages to clump together. So tasty on top of Pumpkin Greek Yogurt. This recipe is a simple way to infuse the flavors of a holiday staple into a pantry staple. I may never go back to regular granola. Adapted from Alton Brown. Preheat oven to 250 degrees F. Line a sheet pan with parchment paper or a silicone baking mat. 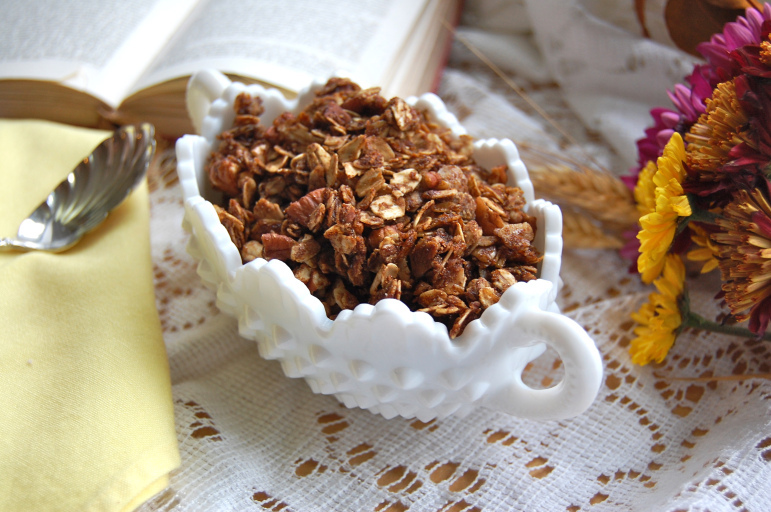 In a large bowl, combine the oats, pecans, brown sugar, cinnamon, ginger, nutmeg, and cloves. In a separate bowl, whisk together molasses, oil, and salt. Combine both mixtures. Work the liquid mixture into the oat mixture until everything is moistened. Pour onto sheet pan. Cook for 1 hour and 15 minutes, stirring every 15 minutes to achieve an even color. Remove from oven and let the granola come to room temperature in the pan. Add mix-ins* if desired and store in an airtight container.